This website is all about building WordPress websites that make money, but did you know that ugly websites can make money too? In fact having a fantastic design will not guarantee that you will make a brass razoo! You can equally make money with a boring minimalist WordPress theme that is almost ugly or a premium theme that looks awesome. The fact is, these ugly websites that make money only prove that the website design does not always contribute to a sites earnings. Lets take a good look at some extremely ugly websites that make money by the truckload. Markus Frind, the founder of plenty of fish, lazes around most days after completing a gruelling 10 minutes work on his super ugly, but profitable website. Markus has no college degrees to speak of yet rakes in over 10 million dollars a year at pof.com, approximately 5 million in pure profit. The site itself is so simply that it is really ugly. 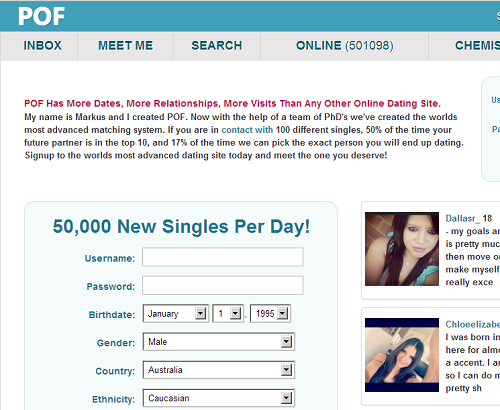 In fact POF looks even worse when you actually try and see how Markus makes his money. The Craigslist business model seems crazy to some, but Craigslist President and Chief Executive Jim Buckmaster says this company has no plans to make more money. It seems they only need enough money to pay a few business expenses like web hosting services, electricity, and staff wages. The potential for this ugly website to make millions upon millions is obvious. There is no advertising, or none that is obvious to me anyway. 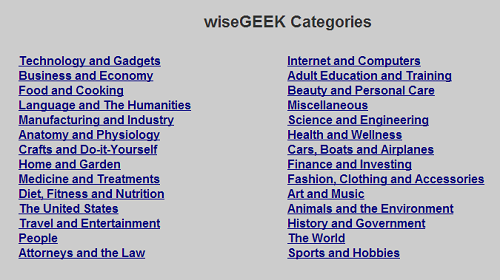 The screenshot below shows the main menu on the Wisegeek homepage. Simple and ugly. 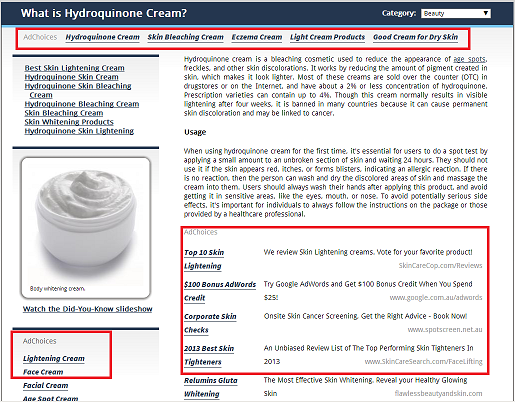 But investigate further and you will see a huge amount of advertising on each and every content page. If you press on one of these links that lead to a category page you will see 4 featured graphics at the top, then after that the page has literally thousands of links. It looks like they have listed every article in that section on that page. Then when you look at one of these articles, the post has a huge amount of ads scattered through the content. I do not really know how much money this site makes but I guarantee it is a big chunk of change. The one thing that all these ugly websites have is content that matches what their users want. They are simply providing what is needed and doing it well. Also creating an authority website has nothing to do with expensive themes. Therefore in this case, content is king here. This really struck a chord with me a s I’ve been saying “content is king” for years and I’m known at work for my attention to facts over style! After spending some time getting the content right on my own website I’m now trying to get a little style too. But you know what…when driving traffic to a website it’s content that counts in the eyes of the search engines as well as the end users. Hi Mitz. Ugly landing pages and ugly ads also often perform much better than their pretty counterparts. Definitely worth split testing in some ugly! If my sites were making a million a year, I could care less if people classify them as ugly. As they say, “beauty is only skin deep.” And what lies behind that source code, is what is making them the greenbacks. In this case – PLEASE let my site be ugly! Chavol recently posted..What is interpreneur about? LOL I agree! Let my site be ugly too! I think they are making truckloads because I have checked their content out and it is fantastic! And content like this makes great money. i got that these three sites can make money but there are allot of factors that bring them here(their sale). i said, not only the design or pattern they apply can make that traffic means money but the reality is behind the scenes and for that they will definitely work allot. thank you for the nice sharing!! Yes but it is nice to have a closer look at the why and how. Can you see yourself replicating something like this? I guess it’s to harsh to say that these sites are ugly. Simple or simplicity might be the word to fit. But seriously, these sites have no taste in art but their profit is much more higher than those who have good, if not best artistic designs. I guess it’s all about content and unique service of a site which can make a lot of profit out of it. Though these sites has proven us that design is not a factor, I guess it’s still safe to say that design sometimes gives an edge. A design can often arouse a reader’s interest which can also be a factor to generate traffic in any site. And yes a design can spark a readers interest. Very true. I would not say that they are ugly, but just not nice for the eye – very simple. For sure, one of the important points is the content. I don’t wanna call them ugly websites, but rather simple websites with user-friendly features. It is not all about the website design, but rather it is offering. Craigslist could make millions if they install Adsense or any other monetization software..POF has been amongst the list of top adsense earners for a while now.I guess design has little to do as far as popularity of the website is concerned.Websites only need to be usable. Yes the amount of traffic they get would make all these sites an Adsense winner. You are absolutely right! Those websites are pretty ugly but serve the purpose, thus making lots of money. The WiseGeek seems to be the ugliest one and most boring one. I wonder how they manage to get their traffic. Anyway, web surfers value the good content the most, so we need to always remember that! I think they would get a lot of traffic from the search engines because they are covering a lot of topics thoroughly. 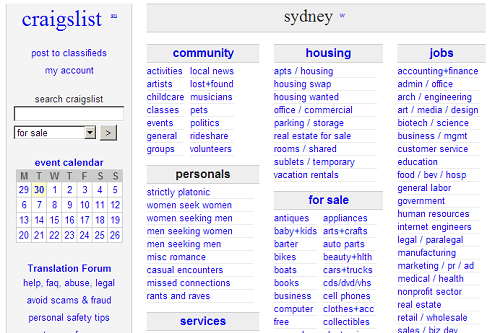 It goes to prove that it’s the content that’s important – and also word of mouth in the case of Craigslist. WordPress is great for being so quick to implement, especially if you use one of the free themes. Even those can be quite fancy with responsive layouts and such. OMG its an encyclopedia, one can find any article and query there, after that i digged some statistics i got to know that its PR is 6 and alexa is 2K. Sometimes ugly sites are also very fruitful,it all depends on the work done on the site. Yes these sites are a perfect example of fruitful sites. I just visited these site and really find their design something complicated and ugly.But they still make money. This means great idea always works. 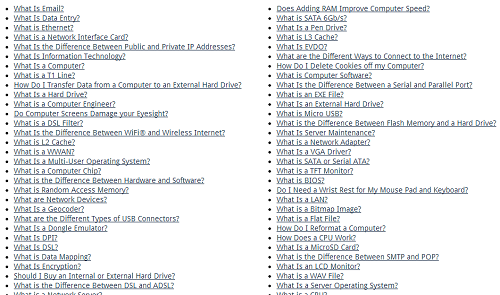 They are also complicated sites and the navigation on wisegeek is extremely simple. You have to go to the homepage and drill down to find anything or search. I guess they are hoping people leave through an ad. There is not many options. Your post about ugly website reminded me of those local tv commercials that are really annoying. So annoying that you cannot forget about them and will remember when the need for them arise. You are so right about contents. The more relevant they are the more importance they have in the ranks. Yes they are like those annoying ads on TV. They keep making them so they must work. Yes it is even better when the users create the awesome, unique content for you. Well, Ugly or pretty doesn’t matter a lot. If the content is relevant and of high quality, then visitor will be around it. No matter which platform is used, how the design is managed etc. I am not refusing the importance of UI, but still the content is king. I have many example of websites, having basic layouts but still the king of industry, like this. Ugly websites that provide great information will always work better than a high quality designed website with no value. Making money online is about providing solutions to problems, and it’s better to hire a copywriter than spending money on a designer. Thanks for showing us these ugly but great and famous websites Mitz. that is why the luck factor can never be underestimated anywhere. It has to do its offering everywhere. Many a times we do hard work and still not get success and there are still some times when we get the success very easily! Yes in that you will need to take every step very carefully otherwise it could be prove harmful for you. Excellent Post Mitz. I am the same as you. An ugly site will turn me off. You know, I think of my website as meeting place. People come in, look around, maybe interact a bit via comments and so on. A nice looking site to me is like an invitation to stay. But I am not only talking about esthetics but also the content.The two go hand in hand . Yes a nice site is better but this shows that sometimes it does not matter. I agree that ugly sites can make money too, however, those 3 are directory type of sites, not blogs. I still believe blogs with good design and layout will surpass the look of the other sites, however this tells us that design and userability alone won’t make the money. There are lots more in the subsidiary that count like generating relevant traffic and converting it into sales. John Gibb recently posted..Tunnel Your Vision For Long Term Affiliate Success! Am for the same opinion John. I think blogs should be pleasing to the eye. Apart from the physical appearance, they content too should be pleasing to the reader. Ok what about http://www.dailyblogtips.com/ ?? I do not worry about what kind of sites they are..I am not even sure what the difference is between a top blog and a top website? They both make money by providing some type of service or information. But if sometime your hard-work matters more than what others see in you. Same applies to all of us and with these sites too. Yes they all have the information covered completely. That is the key here. Money making from online is always liked by all. I think this is also a way to improve your skills to making money from online. Aren’t these ?